Retailers, craftsmen, truckers, mechanics, antique dealers, mail order and Internet merchants – whatever your business…when it's time to grow, an American Steel Span storage building kit can ease those growing pains. Metal building kits are inexpensive and can be erected in a fraction of the time that it takes to construct a conventional building. 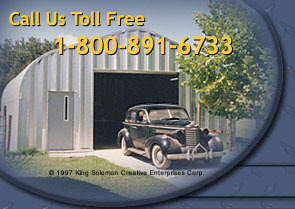 Storage building kits are available in sizes from 10 to 100 feet wide and in unlimited lengths. Virtually maintenance–free, a steel building kit will allow you to spend more time on your business and less time on upkeep. Whether you need room to grow, room to work or room to play, American Steel Span storage building kits are the perfect solution to your building needs.